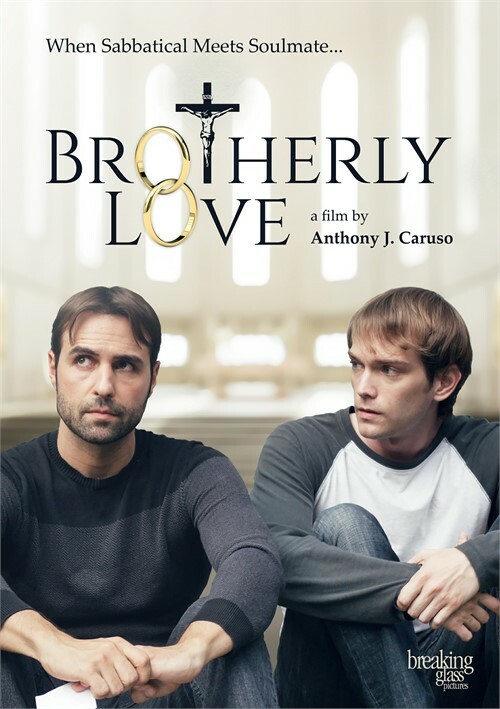 Brotherly Love is the movie adaptation of the Lambda Literary Award-nominated novel Seventy Times Seven by Salvatore Sapienza. Which call do you answer? The one you feel from God or the one you feel about your authentic self? This is the dilemma at hand for Brother Vito (played by writer/director Anthony J. Caruso) as he must decide between becoming a Brother or declaring his love for Gabe (Derek Babb). Shot entirely in Austin, TX and with a local cast and crew, Brotherly Love is a fresh take on the traditional gay love story. Guaranteed to ship today if ordered within the next 13 minutes. This movie warms my heart. I can't think of a better way to describe the meaning of love. Anthony J. Caruso makes his feature film writing/directing debut with his adaptation of Salvatore Sapienza's "Seventy Times Seventy" about a gay Catholic priest who has to choose between his vocation and the love of his life. Brother Vito Fortunato (Caruso) is a modern Seminarian as he is openly gay to all the other Brothers in the Order that he belongs too, and he hangs out in gay bars with his best friend from his previous secular life. The film begins with Brother Vito outside of a club one night being very tempted to break his vow of chastity with a very handsome stranger. When he confesses his feelings to his Spiritual Adviser Sister Peggy (June Griffin Garcia) and tells her that he is struggling with temptations, she suggests that he goes away to Austin for a working vacation at Catholic Aids Care Center. It would be a break and give him time to renew himself. Once he gets to Austin, he meets handsome landscaper Gabe (Derek Babb), one of his new colleagues and soon to be best friend. Soon the two of them are having an innocent night out together in Gabe's very compact trailer watching a Streisand film. Gabe seems to be really into brother Vito. Gabe feels Vito's reluctance to let their relationship grow and he is determined to show Vito that two men can really love each other and live together happily as a couple. He introduces him to his neighbors Randy (Ed Pope) and Winston (Steve Uzzell) who have been together for many years. Nothing warms the heart like a good romantic film with a happy ending. It also helps that it is well made. Vito is a charmer and he seems to be amid campy gay characters that are stereotypical at times. He fact that he looks at the Catholic church through modern eyes and for many this will seem to be quite strange. He also seemed to expose himself to temptations that he knew would be difficult to resist. Babb as Gabe brings a sense of realism to the film through his natural talent. I was totally entertained and really loved the film.